Amaryllis Musings: Je suis un artist! Oui oui! Imagine me sitting in a Parisian cafe, laptop on a lovely wrote iron table, in a navy and white striped top, red bandanna tied around my neck and a beret perched jauntily on my head*. Why yes, I am feeling quite French today mainly because of my recent adventures in painting. My friend Sarah and I signed up for a Colors and Bottles night through Groupon. Basically the premise is that you pay a fee and go and drink and be merry with 25 strangers and paint for 3 hours. And that is just what we did. We picked a date that worked and then realized that the painting we would make was on the calendar. 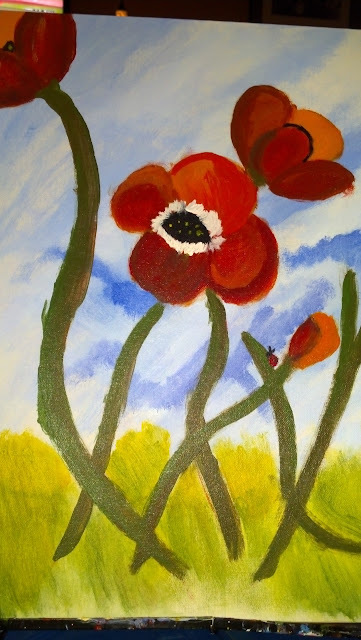 So on Wednesday, we went and painted poppies. I do like poppies so it was a happy coincidence but none the less, poppies will putt them to sleep! I had to include the Wizard of Oz scene in here somewhere when talking about poppies. Anyway, the food was great, and I would definitely go back to the Modern Cafe in the future. We sat down at easels and were given brushes and acrylic paint. The teacher gave us some instruction but in general there were no real "rules". When it comes to painting, I have some technique but I just don't have the vision to see something I want to paint and then make it happen. Therefore some instruction was nice, I didn't have to stress over what to make just follow the general steps. So we made a blue sky, and the poppies, and the ground. There was someone who even made a whole mountain scene in the background. So there you have the work of my own hands. I am super proud of the shading I did and the sky is kind of awesome. I think the bigger thing is that I am impressed at how awesome it was to paint with acrylic. When I think of it I am reminded of banners we made in high school for band and football. This however was really nice and dried fast so there were no messy wet painting to take home with us. I think I will totally sign up to do this again. It was a nice and relaxing evening and fun as you tried to recreate a pretty painting from scratch. Ah but I can still imagine you there. That is such a fantastic idea to go and take that class, it is definitely a different way to go out and do something. Your painting is adorable, are you going to frame it? Me too but really I would rather be on vacation anywhere. I think I am going to frame it and put it in my dining room.